The Houston Chronicle featured my op-ed as the lead in their Sunday edition Opinion section yesterday. Since I've had problems with the reliability of the Chronicle archives in the past (especially after a few years pass), I've included the full text below. Looking forward to your thoughts in the comments! As both H-GAC and Metro prepare new long-term transit plans, Houston is facing a critical decision point between two paths that will determine our transportation future for decades to come – and whether we continue to thrive and grow as a global city or we become another gridlocked, unaffordable LA. The first path - sometimes called for by local officials - is the traditional approach of adding rail as cities grow beyond a certain size, with New York, Washington DC, Chicago, and San Francisco being the largest examples. This is not only extremely expensive to build – New York is spending $2.7 billion per mile on the Second Avenue Subway – but expensive to maintain, with massive maintenance backlogs causing well-publicized chronic service problems in New York, Washington DC, and San Francisco. Even worse, it turns out adding rail to sprawling Sunbelt cities built in the automobile age has been a costly failure almost everywhere, including recent bad press on Dallas DART’s high costs and low ridership, Denver’s $4.7 billion FasTracks, and LA’s $9 billion rail investment leading to overall transit ridership declines. If LA - with twice our density, far worse traffic congestion, and perfect walking/waiting weather - can’t make massive rail investments pay off, what chance does Houston have? Beyond these issues, traditional transit is facing the same technological disruption as many other industries with the imminent arrival of autonomous vehicles. Shared ride services like Uber and Lyft are already causing broad transit ridership declines across the country, and estimates are that their prices could drop even further to $0.35/mile once they go autonomous in the 2020s. Despite the high risk of building obsolete and costly white elephants with taxpayer dollars, some cities continue to plunge obliviously into this technological buzz saw with obscenely expensive old-school rail plans like $54 billion in Seattle, $5.2 billion in Nashville, and $10+ billion in Honolulu ($10,500 per Oahu resident!). And we’re not immune to the insanity: some of the rail plans under consideration for Houston could easily run into several tens of billions of dollars. So what’s a second path that rides this disruptive technological wave rather than drowns under it? There are hints of it in the Chronicle’s recent coverage of Metro’s commuter bus expansions and the Downtown Management District’s ‘Metro MAX’ proposal of two-way HOV-lane bus service connecting more than a dozen major job centers. Houston is a dispersed city with many major job centers besides Downtown – like Uptown, the Texas Medical Center, Greenway, Energy Corridor, Westchase, Memorial City, etc. - needing commuter services that would be poorly served by a downtown-centric rail network feeding less than 7% of the area’s jobs. Taking it to the next level would be our proposal of an expanded network of two-way Managed eXpress (MaX) freeway lanes connecting every job center to every neighborhood. These lanes would be explicitly managed to move the maximum number of people at maximum speed, including converting to autonomous-only when the technology becomes available. At that point, vehicles can run safely at much higher speeds while platooning more closely together to increase capacity. These lanes are far more cost-effective and flexible than rail, and we estimate that such a network could support a million commuters to a million jobs Houston’s core job centers – more core jobs than any other city in the country outside of Manhattan. But what’s the experience like for the actual commuter? With rail, it’s infrequent service (big capacity = longer waits to fill) with many intermediate stops, averaging 25-35 mph dropping you far from your workplace and requiring time-consuming walks or transfers in all sorts of weather. With MaX Lanes you may be in a comfortable public or private Park-and-Ride bus or a smaller shared commuter vehicle that picks you up along with others in your neighborhood going to the same job center (such custom vehicles may even have private compartments). As they enter the MaX Lanes, they go into autonomous “auto-pilot” mode (if they’re not already) and accelerate to high speeds – possibly as high as 100+mph! (can you imagine the global publicity for Houston and our image if we’re the first city on the planet to offer affordable 100+mph daily commuter services?!) They then go nonstop to your job center wherever it may be, where they exit and circulate to get you right to your building – no transfers and no risk of walking or waiting in summer heat or downpours. A faster, better experience at a far lower cost – it’s no contest. Historically, Houston has always been comfortable ignoring the conventional wisdom and going our own pragmatic way - like being the largest city in the country without zoning and building an extensive HOV/HOT bus lane network instead of costly, inflexible, and slow commuter rail. We should continue that iconoclastic tradition and publicly embrace the next generation of transit instead of chasing flashy, over-priced, ineffective rail projects like other cities (and put the savings towards flood control!). Two paths forward – one looking to the past and one looking to the future. The choice is ours. Tory Gattis is a Founding Senior Fellow with the Center for Opportunity Urbanism and writes the Houston Strategies blog. His report on MaX Lanes for Houston can be found here. Before getting to this week's items, PBS News Hour had a 9-minute segment this week on Houston development after Harvey, which includes about a minute interviewing me starting at the 6:50 point. They interviewed me for about a half-hour on the top of my condo midrise in Midtown on Jan 12th, and it was freezing that day, thus the heavy coat. I think they did a fair job with the sound bites and summary of our conversation – I love that they used my “don’t throw the development baby out with the hurricane bathwater” line (which is my mantra/tagline on all things Harvey) - although I wish they had included the stat about Houston land developed since 1992 would have absorbed less than 0.4% of the water that fell. Speaking of Harvey, the National Hurricane Center has officially declared it a 1,000-year event (scroll down). Given that scale, it's amazing we did as well as we did. It also seems to me that it creates a very simple benchmark for new development: if it wouldn't have flooded during Harvey, it's fine. Boston explores what it would be like if they got a Harvey-like rainfall, and it's not pretty. No city could cope with the amount of rain we had. Hat tip to George. I like that he gives a shout-out to the flexibility and adapatability of our lack of zoning, but I'm not as opposed to development on the fringes as he is. I like that we allow both urban and suburban development and let people choose what works for their lives. The Kinder Institute blog has their own discussion of regulatory changes to make Houston more walkable, which sound mostly ok to me, although I'm more of a fan of neighborhood opt-in rather than mandatory. Seven more good recommendations for a post-Harvey Houston. Texas Monthly: Further Proof That Houston Is So Much Bigger Than Most Cities. Great comparative maps and they don't even include the Grand Parkway loop! Hat tip to Howard. Guardian profile of a really interesting free-market/libertarian architect (Howard Roark! ;-) that is being attacked by more extreme urbanists on the left. Hat tip to George. From Market Urbanist Scott Beyer: Richard Florida's book hits, then misses, the New Urban crisis: If spatial segregation is the cause of urban America’s problems, then zoning deregulation is the solution. Maybe not a surprise, but I love this and totally agree! Another great Market Urbanism post on the history and market distortions of zoning, with something originally aimed at preventing nuisances quickly being abused to be exclusionary. I've got more, but that's already too much for one week! There are some follow-ups to my last two posts on Amazon HQ2 and Houston transit, including addendums/updates at the end of both posts you may want to check out, including the news that Texas Monthly backed up our creative "think big" Astrodome Amazon HQ2 idea vs. dismissal by City officials! A new thought since my last post: Amazon's rejection of Houston for HQ2 could have been as simple as bad PR optics: it just looks bad to squeeze a city for big incentives that just went through the most expensive natural disaster in history. They probably imagined future nightmare stories in the media: "well, we would have spent all this money on new flood control infrastructure, but we had to give it to Amazon instead." "While there are real benefits like this NYT profile to making the Amazon cut, I don’t think cities that didn’t make it should beat themselves up too much. We really don’t know the factors that went into deciding who was in and who was out. Some of the people who are in may have been put there for pure misdirection for all we know. Maybe even Indianapolis. And being left off the list may not be reflective of the city as a whole. Cleveland, for example, has many problems, but is also one of the few place with an actual HQ2 scale entity locally in the Cleveland Clinic. In that health care space, Cleveland has proven it can attract the best talent in the world at scale. That’s just not relevant to Amazon. So while those who did make the list should feel good about it, I don’t think those who didn’t should wallow in undue negativity. As the New York Times notes, even the “losers” are potentially in line for future Amazon investments." First, to set the stage, two different pieces on the failure of rail in LA, which has invested billions while losing overall ridership, even with twice the density, worse traffic congestion, and perfect walking/waiting weather vs. Houston. 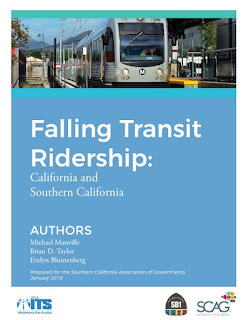 Indeed, the LA Times reported a while back that despite billions in rail transit investments in LA, overall transit ridership had fallen. And it is falling as we speak. There are many possible explanations for these declines. Bus ridership is falling in many markets, and LA is still very heavily skewed towards buses. Uber and Lyft are eating into market share. 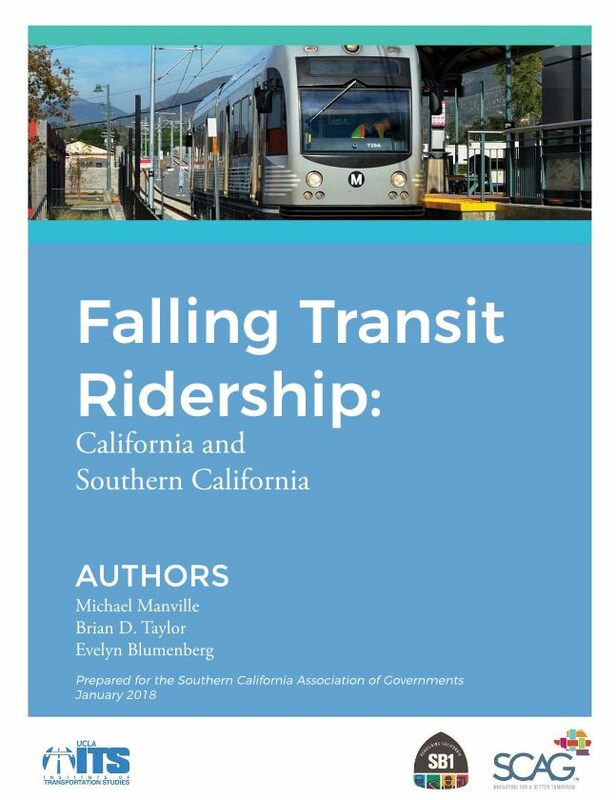 I’m not ready to pronounce the death of transit in LA by any means, but the clearly underwhelming results for rail in LA despite very large investment in new lines, a relatively dense environment, and horrible traffic congestion, is something that transit advocates need to seriously confront." And a CityLab piece, Why Is L.A. Expanding Transit—and Losing Riders? based on this report (and the Urbanophile weighs in as well). The conclusion: the poor are making their lives easier by buying cars, so we need to make driving more expensive and painful to force them back to long, inconvenient transit rides! Nothing about improving service to attract riders. Absolutely nauseating. Last night someone was whining on a food group about being towed. They didn't explicitly blame the restaurant, yet they were leaning in that direction. Someone piped up about our non-existent public transportation. That annoyed me and I commented. People in Houston are snobs about riding the bus. Not so much the rail, but they wouldn't be caught dead on METRO buses. As expected, I got the typical pushback that Houston's system isn't as good as other big cities. Usually this indicates some confirmation bias when I hear it – because most Houstonians I know haven't been on a bus as an adult. Here’s where I’m going to disagree with the average Houstonian: Adjusted for population density-weighted service, Houston might have the best bus service of any major city. I ride the bus often. The route improvements made in 2016 (shout out to Christof Spieler) helped tremendously. Houston is a driving city due to low population density. The bus system serves it accordingly. NYC has 27,500 people per square mile. SF has 17,000. Boston 13,300. Chicago 11,800. Houston? A paltry 3,400. We are almost twice as scattered as the very fragmented LA. Of the top 10 cities by population, Phoenix has us beat with about 2,800 people per square mile. It also has what I think is superior public transportation based on the fact that the rail is more useful as it connects downtown and beyond to the airport. Phoenix costs more to ride, though. As does pretty much every other major city. Most big cities are $2-$2.50 with stingy transfers. Houston is $1.25 with a three-hour all-way transfer window. It’s far from perfect, but pretty much every major arterial has a bus coming in 10 to 15 min. Minor ones are 20-30 min. That’s about the same as Chicago CTA – probably my favorite system in the country after DC. I do wish we had a more useful rail system like Chicago. But 100 years ago there were 2.7 million people in Chicago proper and cars were new tech. They built accordingly. There’s not even that many in Houston proper right now, and we had about 5% of that a century ago. And we built accordingly too – a city that came to life after cars were common with roughly a third the density. The snobbery that ignores the actual performance amuses me. It's simply not cool to ride the bus in Houston." Historically, Houston has always been comfortable ignoring the conventional wisdom and going our own pragmatic way - like being the largest city in the country without zoning and building an extensive HOV/HOT bus lane network instead of costly, inflexible, and slow commuter rail. Maybe it's time we continue that tradition and publicly embrace "uncool" transit like buses (and MaX Lanes) instead of chasing flashy, over-priced, ineffective rail and streetcar (ugh) projects like other cities?